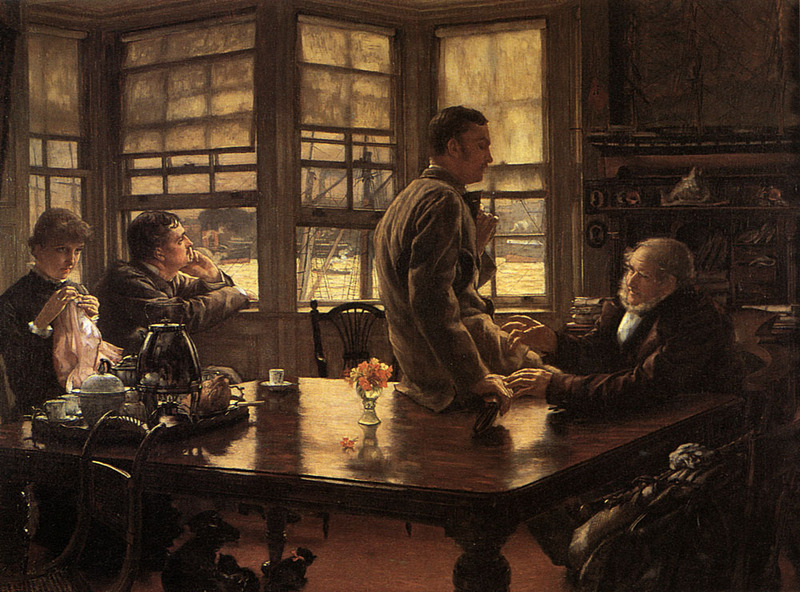 James Tissot (1836–1902), Bad News (The Parting) (1872), oil on canvas, 68.6 × 91.4 cm (27 × 36 in), National Museum Cardiff, Cardiff, Wales. Wikimedia Commons. James Tissot (1836–1902) is not known as a narrative painter, but in looking through a lot of his works, it is clear that many tell stories. As I recounted in my summary of his life and work, his early professional career was based in Paris, and opened with success in the Salon in 1859. Those early years, until about 1862, were dominated by the influence of the Belgian painter Baron Henri Leys (1815-1869), and by Tissot’s love of historical romanticism, particularly set in the Middle Ages. Henri Leys (1815–1869), Albrecht Dürer visiting Antwerp in 1520 (1855), oil on panel, 140 × 210 cm, Koninklijk Museum voor Schone Kunsten Antwerpen, Antwerp, Belgium. Wikimedia Commons. Henri Leys’ Albrecht Dürer visiting Antwerp in 1520 (1855) gives a good idea of the paintings that Tissot admired most: realist in detail, dominated by earth colours with a wide tonal range but tending towards the dark, and showing gentle historical stories built from a multitude of figures. Like many painters of the day, Leys did not go for the climax or peripeteia of thrilling or strongly emotional stories. He also painted at least one scene derived from Goethe’s Faust. Many of Tissot’s earliest paintings are liberally based on Goethe’s Faust, as interpreted by Gounod’s opera, which is based on Carré’s play Faust and Marguerite. 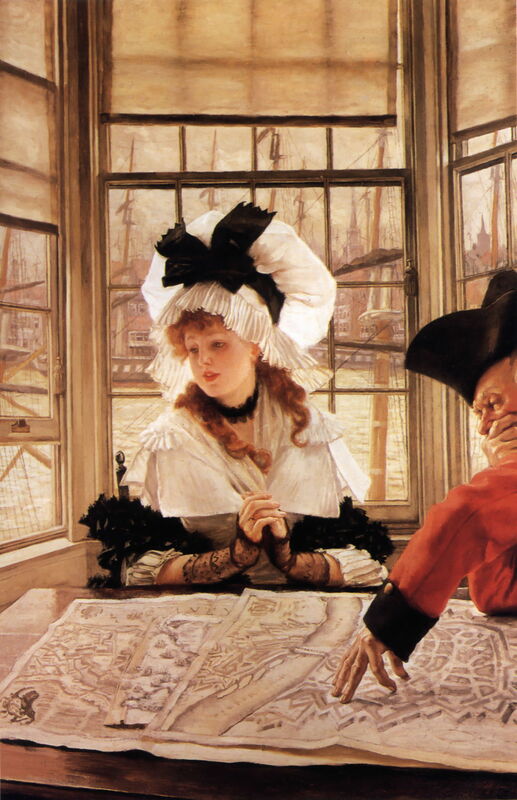 Hence the character of Gretchen is named Marguerite, the focal figure in Tissot’s works. Faust, who has sold his soul to the devil in return for everlasting youth, falls madly in love with the pure Marguerite. In Act 3 of the opera, Faust starts to seduce her with exquisite jewellery. He joins Marguerite in her garden, and she allows him to kiss her, before asking him to go away. 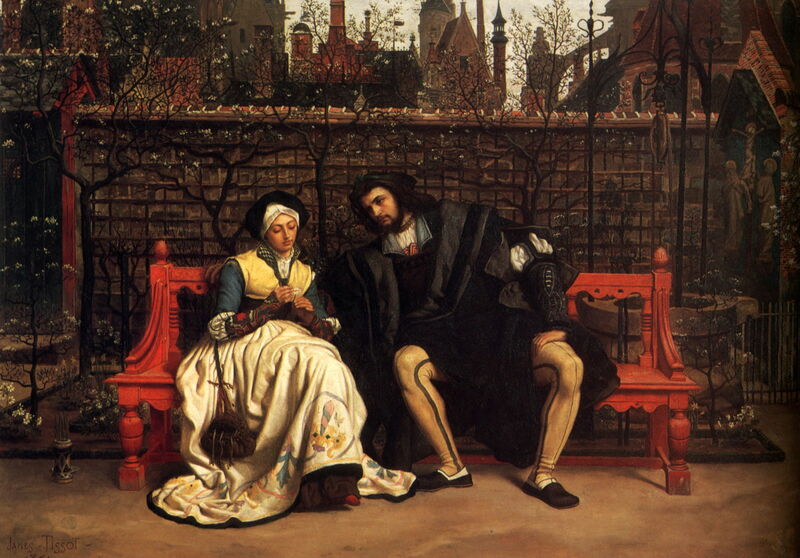 Faust and Marguerite in the Garden (1861) shows the couple sat together on a bench, as Faust proceeds with his seduction. He succeeds, gets her pregnant, and then abandons her. Marguerite allows the baby to die, and is shunned and taunted by the locals. She resolves to go to church to repent her sins. The devil brings her visions of her previously happy life in an effort to prevent her from praying, and she faints in the struggle. 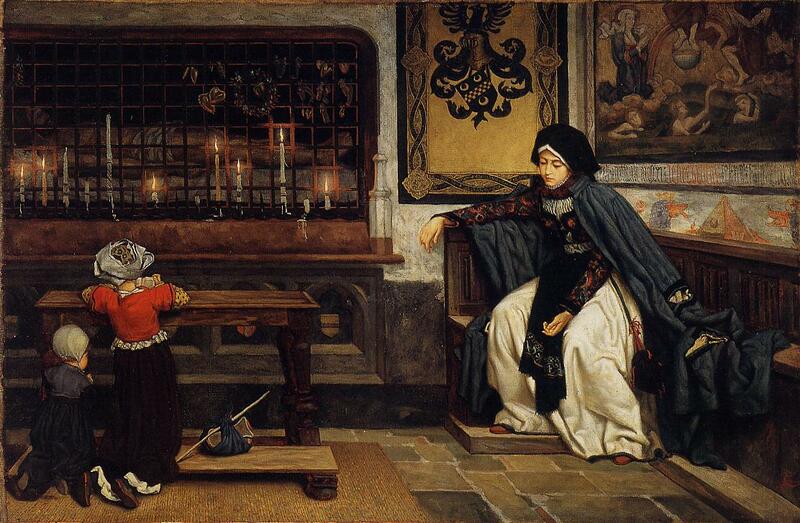 When Marguerite recovers from her faint she finally goes to pray: the scene (from Act 4) shown in Tissot’s Marguerite in Church (c 1861). She is here almost cast in the role of the penitent Magdalene, a theme which Tissot was to visit in his later paintings of the life of Christ. Although a static tableau like Faust and Marguerite in the Garden, Tissot skilfully weaves the story into his composition. Two innocent children kneel in front of a shrine, praying in the normal and obvious manner. Marguerite’s inner turmoil cannot bring her any closer to that shrine, or even to break herself out of her posture of dejection, eyes cast down, hands apart rather than held together in prayer. Above her is a painting of the Last Judgement, which anticipates her own fate in Act 5 of the opera. Tissot’s explorations of Faust reached a climax in about 1861, and he then painted a series of much-admired works based on the theme of the prodigal son. These are derived from the parable related by Jesus, told in the Gospel of Luke chapter 15 verses 11-32. A father has two sons, of whom the younger asks for his inheritance before the father dies. That son then squanders his fortune, and becomes destitute to the point where he eats from the pigs’ trough. He then returns home, expecting to be put to work by his father in punishment for his profligacy. His father finds him on the road, welcomes him back, and feasts the return of his prodigal son. The older son is unhappy at this, but his father points out that he now has the entire inheritance, and that his younger brother, who had been lost, has now been found. 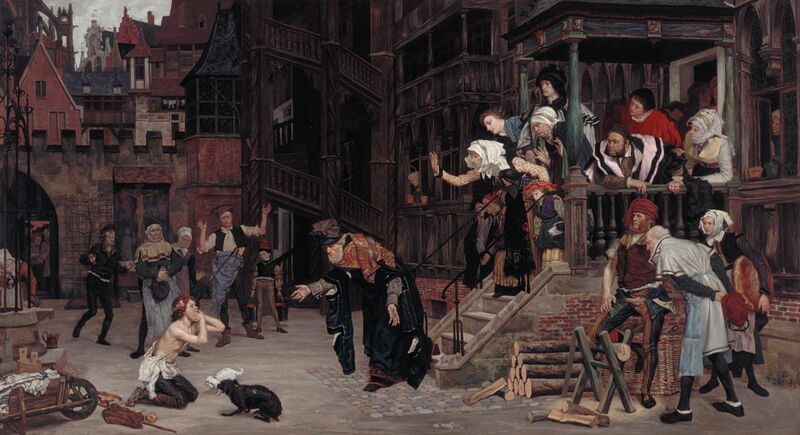 The Return of the Prodigal Son (1862) still shows the influence of Leys, but Tissot then launched out more on themes and motifs of his own choosing, and his style became more distinct too. James Tissot (1836–1902), A Widow (1868), oil on canvas, 68.6 x 49.5 cm, Private collection. Wikimedia Commons. By the time that he painted A Widow in 1868, he had mastered the subtle juxtaposition of clues to narratives which were often very modern in nature. The widow of the title pauses in her embroidery for a moment and stares in thought into the vague distance. As a young and still attractive woman without a husband, she is at once a bored and listless little girl, and a contented older woman immersed in escapist reading. At the left is a tray with the remains of drinks, either wine or a fortified wine, which were taken in company with others. Although the widow wears her sombre costume, she has bucked the convention of making herself look as unattractive as possible, and is enjoying the company of the bright flowers beside her. Tissot leaves us to speculate as to her future, rather than condemning her violations of etiquette. 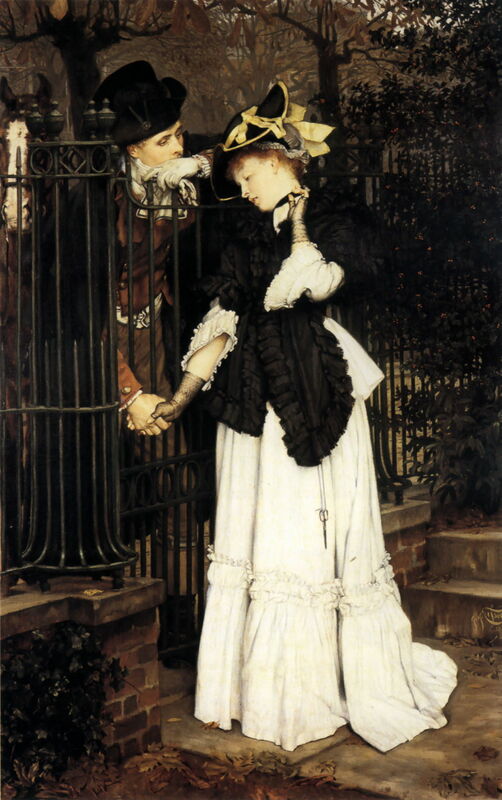 James Tissot (1836–1902), The Farewells (1871), oil on canvas, 100.3 x 62 cm, Bristol Museums and Art Gallery, Bristol, England. Wikimedia Commons. 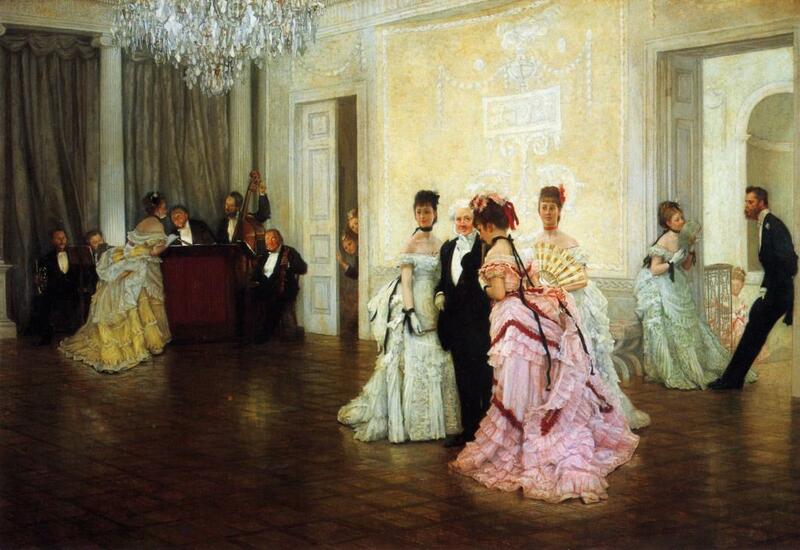 Tissot painted The Farewells soon after his flight to London in the summer of 1871. This couple, separated by the iron rails of a closed gate, are in the dress of the late 1700s. The man stares intently at the woman, his gloved left hand resting on the spikes along the top of the gate, and his ungloved right hand grasps her left. She plays idly with her clothing with her other hand, and looks down, towards their hands. Reading her clothing, she is dressed very plainly, implying that she was a governess, perhaps. A pair of scissors suspended by string on her left side would fit with that, and they are symbols of the parting which is taking place. This is reinforced by the autumn season, and dead leaves at the lower edge of the canvas. However, there is some hope if the floral symbols are accurate: the ivy in the lower left is indicative of fidelity and marriage, while the holly at the right invokes hope and passion. 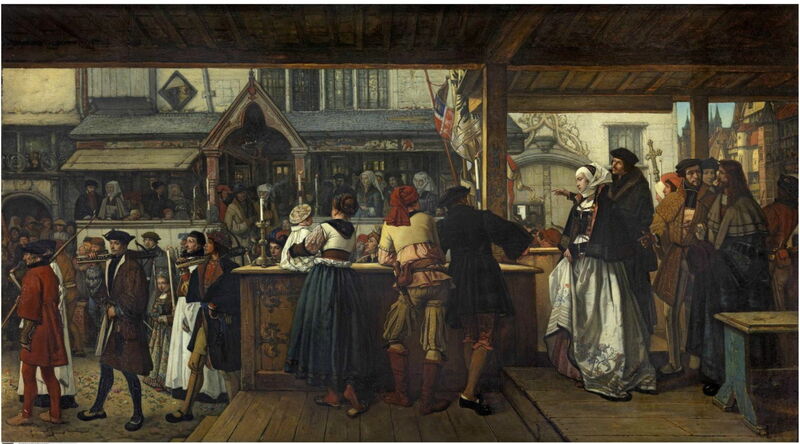 The following year, Tissot embarked on a series of paintings and engravings which were set in a tavern on the bank of the River Thames in London, probably in Rotherhithe or Wapping. The first to be exhibited was his An Interesting Story (c 1872), which set the pattern. It is the late 1700s, and an old soldier is telling one or more pretty young women interminable and incomprehensible stories about his military career, with the aid of charts spread out on the table. Here, the story is dubbed ‘interesting’ in irony. James Tissot (1836–1902), The Tedious Story (c 1872), oil on canvas, dimensions not known, Private collection. Wikimedia Commons. In The Tedious Story (c 1872), there can be no doubt that the young woman has drifted off into a world of her own, one which is far away from the veteran’s charts. 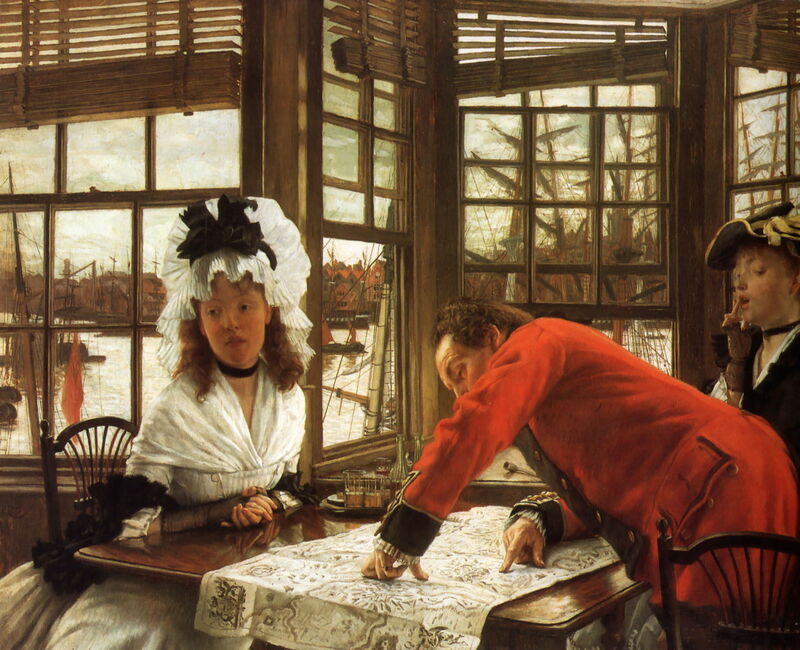 Tissot moved the exterior location further up-river for his Bad News (The Parting) (1872). The soldier is now young, and has just been recalled to duty, to leave the two young women who appear as heartbroken as he does. In the centre of the painting, a small boat full of uniformed soldiers is in transit, presumably coming to take this soldier away with them. 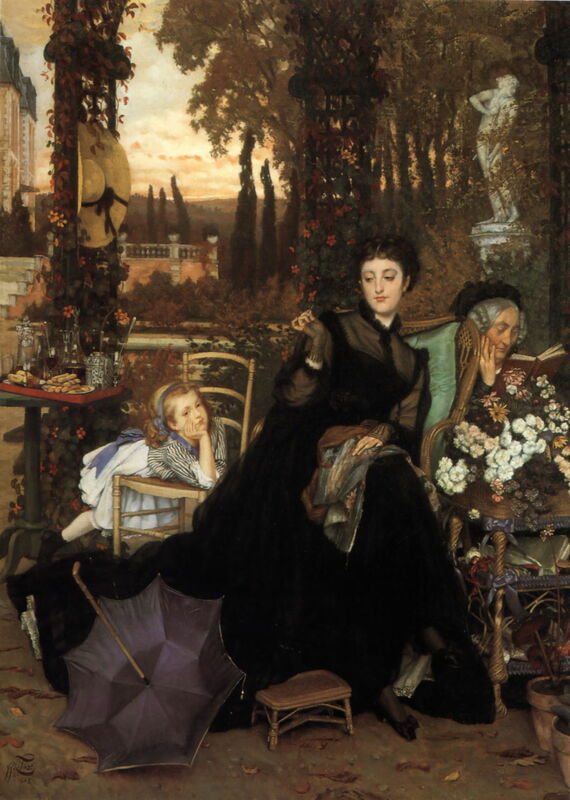 Once again Tissot returns to his enduring theme of loss and separation. James Tissot (1836–1902), Too Early (1873), oil on canvas, 71 × 102 cm, The Guildhall Art Gallery, London. Wikimedia Commons. In contrast, Too Early (1873) is an insightful social comedy: this group has arrived at the soirée on time, when the social convention is always to be late, so that you are not the first to arrive. The four guests are embarrassed, and do not know what to do, so they stand prominently in the middle of the empty floor, while the hostess prepares the musicians, and the host waits idly at the door. 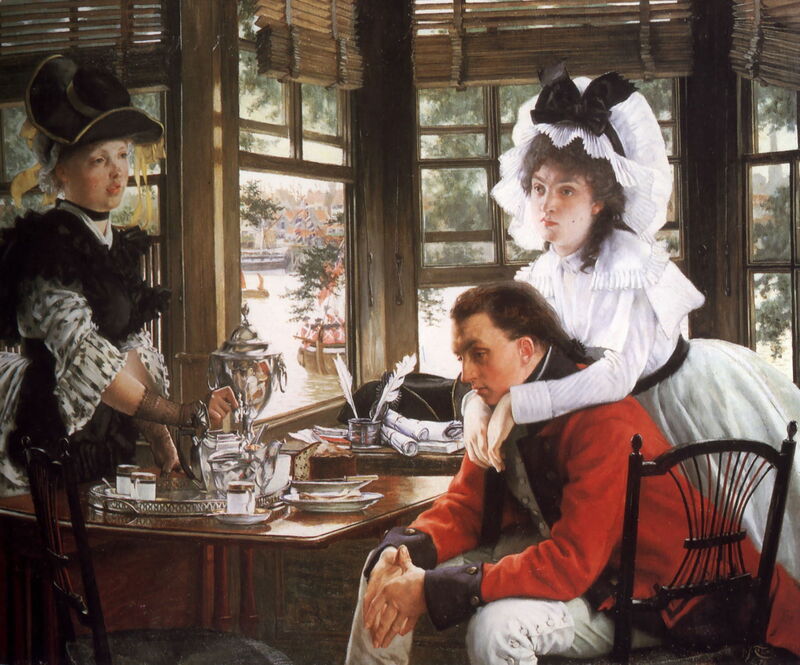 Tissot never really abandoned those who wanted to read stories in his paintings, but his relationship with Kathleen Newton brought him to focus more on her beauty and their love. Towards the end of her brief life, and his stay in London, he decided to revisit the story of the prodigal son. This time, with the examples of Hogarth, Frith, and others who had painted moralist series, he set the story in the present time, and made a complete set of engravings. 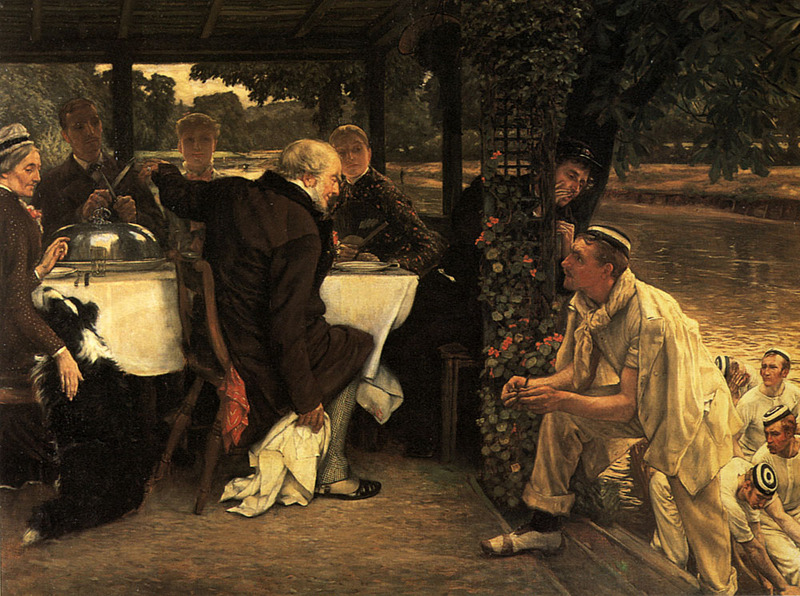 The first of the four paintings in his series The Prodigal Son in Modern Life, The Departure (c 1882) is set in another of his favourite waterside haunts along the Thames. The windows are now grimy, and the light filtered through the smoke of the city. Father, an elderly man, sits giving his younger son advice, having filled that son’s wallet with his share of inheritance. Bags are already packed and ready to go, and under the table a kitten seems to be leaving its litter too. Behind the younger son, one petal has fallen from the nasturtiums which are in a vase. To the left, the older son stares with disappointed disinterest out towards the river. A sister (or perhaps the older brother’s wife) looks up from her sewing towards the father and son. The next two paintings, or prints, take the younger son out to Japan, where there are clear allusions to immoral conduct, then to the prodigal son’s return on board a ship carrying pigs and cattle. James Tissot (1836–1902), The Prodigal Son in Modern Life: The Fatted Calf (c 1882), oil on canvas, dimensions not known, Private collection. Wikimedia Commons. The final painting (or print), The Fatted Calf (c 1882), shows the prodigal son sharpening a knife with which to carve the roast joint of meat concealed under the silver platter on the table. The older brother has just climbed up from a boat on the river, where his friends remain, and is arguing with the father as to why his younger brother should be welcomed back with a ‘fatted calf’. There are other cues carefully placed in this painting: climbing on the trellis are nasturtiums, the flowers securely clustered together again. The mother strokes a dog, a symbol of fidelity, and the prodigal son appears to have gained a pretty female partner too. This series was first exhibited as the centrepiece of his one-man exhibition in the Dudley Gallery, London, in 1882. He finally won a gold medal for it at the Exposition Universelle in Paris in 1889, when he was already busy working on his huge series showing the Life of Jesus Christ, which I will cover in another article. Posted in General, Painting and tagged Leys, narrative, painting, Tissot. Bookmark the permalink.